Andy just brought out the idea to bring me to Arlington National Cemetery in Virginia for it was one of the places visited by tourists and that she never went there. It just got into my mind that I could find the gravesite of my uncle Salvador R. Antonio there since he served in the US Navy, fought in Korean and Vietnam War and later served as security officer at the White House. So I browsed the website of the cemetery and called up. They were asking the date of interment which I didn’t know but they retrieved details based on his name. It was on Section 64 and gravesite 402. It’s incredible that I got it and was so happy about it. We were shocked that on our way to the cemetery, the train we were riding suddenly stopped at McPherson Square Station and the lights went off. Passengers panicked and start knocking the door while security men and the people were looking at us. I was thinking of bomb threat so we got tensed. A security officer opened the emergency door and we went out. We smelled a burning odor. I was just told by the people who saw it that somebody jumped off the rails and crashed on the train we were riding. It might be a suicide. He was a black man who was around 23 years old. It was a scary moment. The train service was suspended for two hours. Luckily we were able to find alternate route of the metro. We arrived at the cemetery just a few meters from the metro station. It is a military cemetery which was established in June 15, 1864 wherein 290,000 were buried in the area of 624 acres. Some of the prominent personalities buried in the area are President John F. Kennedy and Senator Robert Kennedy. Points of interest to visit are the Tomb of the Unknowns, Memorial Amphitheater, and JFK Eternal Flame. I verified the location of the gravesite and got a map. Andy and I went on foot to find it. We saw two burial rites with gun salute. We saw section 64 and started at 6,000 plus until we saw 402. It was so fulfilling to visit my uncle’s gravesite. Tiyo Adong as I call him and his wife intended to adopt me when I was in high school since they only have one child. The papers were already done but his wife retracted and we never heard of any news anymore until his death in 1992. Neither my father nor the rest of their siblings saw his estate to pay their last respect. They instead held a prayer for him and offered mass. I never expected at all that I could visit his gravesite here in the US. All things just really happened for a reason. To land in Maryland is what excited me most. Its for the reason that I am going to see again my good friend Anna Mae Dumaraog who is fondly called Andy. We were together in an exchange program where we went on a cruise to Southeast Asia and Japan. She works now as a teacher in Prince George´s County. Its also because she is a very good host. After several hours of driving from Connecticut, we finally landed to the state of Maryland. We were able to find through the GPS the place of Andy at Harry Truman Drive. We warmly greeted and hugged each other when we met. So Bernard and Cathy dropped by and endorsed me to my next host. It was so wonderful to really have many friends from all over. Andy was able to take a leave of absence from work for two weekdays so she was able to show me around to Washington DC which was so near to her place. I saw some of the great sights and landmarks of America and also to the neighbor state of Virginia. The state of Maryland is one of the 13 original states of America. It was called the Old Line State because Maryland soldiers who fought courageously during the Revolutionary War used the Maryland line as a reference as per instruction by General George Washington. Its also for the reason that it was the dividing line between the land grants given to Willian Penn and Lord Baltimore. One Saturday, Andy and her friends Sol and Loida took me to Baltimore which was an hour drive from her place. It is the largest city in the state of Maryland. We went to Inner Harbor which is a lovely place but its cold in there. There were boats, yachts and the bridge. We went to see the National Aquarium. A variety of fish can be seen there including sharks, stingrays and many others. We watched the dolphin show which they have shown some tricks. The dolphins were adorable. I was not satisfied because it was a short presentation. However we enjoyed watching the 4-D movie at the theater. It was so funny that we had to put on eyeglasses while watching then it was like travelling over and under the sea and air and suddenly water and air also puffed to us audience. They even tickled our feet underneath the chair. We went for a dinner at a Chinese Bistro where we waited for a while since it was jampacked with customers. We dropped by to get cheesecake at the Cheesecake Factory and later ate at home. The First State of the United States is Delaware. It was the first state admitted into the union on December 7, 1787 and the first to ratify the Federal Constitution. Delaware is 1,982 square miles in size and it is the second to the smallest state after Rhode Island. Its capital is Dover and the largest city is Wilmington. I was so grateful for Bernard and Cathy for sacrificing their time to send me off to my next stop, Maryland. We left Norwalk Connecticut at 2pm and reached Wilmington Delaware at 5pm. We stopped to visit a state park called Brandywine Park. We braved the cold just to see the picturesque scene here. It was so cold brought about by closeness to Brandywine River. It was a relaxing place where you can just stroll or jog along the river or make picnics here. There is a nice footbridge present here. We took our photos at the Josephine fountain and at the bridge. Before proceeding, we went for dinner at McDonald’s. I ordered some Caesar Salad and Shamrock Shake which is made of mint leaves and milk. This green shake is offered in time for the Irish festival. We resumed our travel at 7pm. The couple Angelica and Joefel took me home to the Constitution State of Connecticut where they work and live. Their house is located near the Norwalk Hospital. I stayed with them for two days and two nights. I met her mom Tita Angelina and their smart children Alena and Joan. The state of Connecticut is the fifth state to join the union and the Fundamental Orders comprised the first written constitution in history as claimed by a historian but disputed by some however it is thought that many features of the US Constitution were drawn from that document. On that same night, they brought me to the birthday party of their friend Gladys. We were asked at once to eat since we were only the few guests. I met Philip, Carmen and Joed. After some talks they invited me to join their prayer meeting. The very topic of the meeting was the healing of the paralyzed man by Jesus Christ where some people commented “I never saw anything like this.” It was such a beautiful sharing of experiences about the said passage in the Bible. Everyone contributed to the discussion. I shared to the group on how I was enlightened when I attended a pilgrimage to St. Padre Pio. We heard the mass then later we were anointed by the holy oil and touched the gloves of Padre Pio. I also related to them that traveling is a way to appreciate the creation of God by seeing various places, meeting people, experiencing the culture and told them, I have not seen anything like this. The couple whom I accompanied for their dentists’ appointment on the following day took me to the World’s Largest Dairy Store called Stew Leonard’s as deemed by Ripley’s Believe It or Not. It has a wide array of different cheeses and dairy products. It is a grocery with so many other products. The couple shopped foods for our lunch at home. I was entertained in coming to this establishment because they have the mechanized cows sing and roosters crow. Even a banana toy sings. Later, we dropped by to take photo at the Department of Motor Vehicles with the State of Connecticut signage then we visited the Saint Matthew Church. The family has the wireless karaoke so we had some sing-a-long. Even the next day, when Bernard and Cathy came by to send me off to Maryland for the next leg of my journey jammed for sing-along. I was happy to meet again Bernard not in the Philippines anymore but in the US now. After our tour of New York he took me home to Aberdeen-Matawan in New Jersey. It was nicknamed as the Garden State since it has wide area of farmlands and produces fresh fruits and vegetables. It has 21 counties and 566 municipalities. New Jersey was known as the "pathway of the revolution" because there were over 100 battles fought in its soil. From the station we were picked up by his priest friend. Then I met his housemates Kuya Jo, Kuya Milo and Joy. Since Bernard doesn’t know how to cook, he then asked me to cook our dinner. I didn't have any idea of what to cook but we checked the fridge for what was available. I saw vegetables and squid so I cooked seafood chopsuey. Bernard’s housemates were teasing him that he should learn how to cook and not to let his guests cook. Nevertheless, the housemates enjoyed eating the food I prepared. On the following day we went to Jersey City and took the ferry to the Statue of Liberty. After it, we visited the Liberty State Park. It has an area of 1,212 acres. In its US Flag Plaza there were 13 flags representing the original states which were supposed to be seen but only one was displayed especially during winter season. I took photos of the Liberation Monument. There were picnic facilities, playground and boardwalk on the sides of the river where you can walk at and jog around with. From the site, one can see the Statue of Liberty overlook and the Manhattan skyline. Communipaw Terminal is a beautiful and a historic building present. We dropped by to see the Liberty Science Center. A day after the pilgrimage in Pennsylvania, Angelica Sanchez, a former high school classmate and her hubby Joefel arrived at home to visit me and we had a reunion. We didn’t see each other for a long time. We had a good time chatting and updating each other of everyone. We had lunch at a China Buffet resto nearby the place of Bernard. We enjoyed the moment. When we went back, I was surprised to be informed that the couple was taking me for a homestay. I got excited since I will have the chance to see Angelica's family and visit Connecticut. I then rushed to packed my things. I was told by Bernard when I was still in Montreal that he was joining a pilgrimage. I asked him if I can go with them and instantly responded yes. I was happy with that response because I will have the chance to see the shrine and visit the state of Pennsylvania. So with his colleagues and housemates, Kuya Jo, Ate Anne, Joy and Cathy, we went to join the group of Our Lady of Guadalupe Music Ministry of Monmouth County in New Jersey who organized the pilgrimage to Barto Pennsylvania. It was two hours drive. We were received warmly at the Our Lady of Grace Church and they gave a short talk about the history of the shrine and images present there. We moved to the chapel where I saw the confessionary chair and the gloves of Padre Pio. We went to the museum where we saw the replica of the granite tomb of St. Pio and the photo of his body. In the same location, the bedroom, car, statue and many others were exhibited. Adjacent to it was the souvenir shop where I purchased a rosary. Padre Pio is known to be a man of prayer. He was born in Pietrelcina, Italy and he belongs to the Capuchin Order of the Friars Minor. He was ordained to the priesthood at the age of 23. At the age of thirty, he reached the summit of spiritual life and that he prayed continously. On September 20, 1918, the marks of stigmata, the wounds of Christ, appeared on his body while he was praying before a crucifix. He was the first stigmatized priest in the history of Church and he bore the painful wound for fifty years. Later we went to the Most Blessed Sacrament Church in Bally Pennsylvania to attend the mass celebrated by Fr. Ignacio. It was a long mass that it took an hour and a half. There was a talk by the person in charge in the church where she introduced the antique items in the church including the old paintings which have no signature of the artist but only the face strategically located in most of them. The relic can be seen at the St. Paul Chapel located at the back. Some of the religious personalities were buried under. There was a cemetery nearby the church. After taking lunch we went back to the shrine for the Divine Mercy rosary. As a finale we kissed the hand glove of Padre Pio and we were annointed by holy oil of Padre Pio by the priest in charge. It was an enlightening experience attending this pilgrimage. On the following day, we went to Jersey City side to take the ferry to Ellis Island and the Statue of Liberty. Bernard’s housemate Kuya Milo went with us. We arrived early at the ticketing booth and people started to come by. Bernard bought our tickets at USD 12 per person and that includes the monument pass. He was surprised to get it because on the internet it needs an advance reservation. We were lucky to have those tickets. There was a tight security check before boarding the ferry. We have to remove jackets, watch, belts and others. After it we went onward. Ellis Island was our first stop and it’s located in the mouth of Hudson River in the New York Harbor. It was the main entry facility for early immigrants to the US in 1890’s to 1950’s. It was originally called the Little Oyster Island. It is a historical place having a museum where we saw the hall, the three dimensional American flag which has photos of many people. We reviewed the statistics of the immigrants in US including Filipinos. We also went to the gallery of comedian Bob Hope from Britain who became a popular and successful US immigrant. A dormitory room for detained immigrants was also exhibited. We have seen the “Wall of Honor” which was taught to be the list of all the immigrants processed there but it’s actually the names who donated to honor the immigrants. After spending two hours there, we boarded again a ferry and went to see the Monument of the Statue of Liberty. I was so amazing to see the very landmark of America. It is the recognizable icon of US that was presented to her by the people of France in 1886. It is more formally known as Liberty Enlightening the World. The statue is a robed woman holding the torch that gives out light welcoming immigrants and visitors to America. Its armature was designed by Gustav Eiffel while Frederic Bartholdi sculpted it. The statue has a height of 111 ft, 6 inches from the heel to the head and to include the pedestal it would be 305 ft and has a total weight of 225 tons. The face is more than 8 feet tall while the waistline is 35 feet. It has a green color because it was coated with pure copper that gives out the color due to oxidation. The monument was inscribed to the list of UNESCO World Heritage List in 1984. There was again a tight check before entering the monument. Aside from removing things from your self, there was an air puffer that blows into your body to check for some chemicals. We climbed 156 steps on to the museum. Elevators are available to use. Upon entering we saw the torch, the image, face and the feet. It was also exhibited the way they constructed the statue. If you go outside you can get a view of the Manhattan, Ellis Island and Jersey City. Wow I only get to see these scenes from the movies and now it’s for real. What a sight to behold. I got excited since I am continuing my journey to the east coast of United States. My hosts in Montreal sent me off to the Greyhound bus terminal. The bus departed at 12 midnight. An hour later I was waken up by the stopping of the bus to the US immigration checkpoint. All passengers went down with passports on their hands. After submitting my passport, several questions were asked of me such as the duration of my stay, my work in the Philippines, the date that I’m going back to work and how much money do I have. The officer asked for my airline ticket which I placed on my luggage so he even accompanied me to get it and inspect it at the bus compartment. The immigration check was a little bit stringent. There was even a lady who was invited to a room for further questioning. After half an hour, all passengers went back to the bus. We had a lady driver for the said trip. Then we had another short stop at Albany at 4:30am. We arrived at New York City at 7:50am after seven hours and half road trip. I waited for my friend Bernard Bandong, a former elementary and high school classmate, who is now based in New Jersey. I waited for him at the waiting area near gate 66 of the Port Authority terminal but he tried to find me in gates 20's as per his information from the desk. We waited for each other for two hours. He later realized that he did not dial the roaming number that I used to txt him. We were surprised to find each other. He told me that he almost went home. Bernard gave me a hand with my baggage. We started to do a walk tour around Manhattan. I can't believe that I have set my foot in the heart of America, the Land of the Great American Dream. I finally got a taste of the Big Apple. The term was a mystery before but based on the etymologists research findings, it was derived from a New York brothel whose madam was known as Eve. We went to the different numbered streets in Midtown Manhattan and visited the Times Square which is a junction of Broadway and Seventh Avenue, also known as the Crossroads of the World. We had seen the Madam Tussaud Wax Museum. We attended a mass at 12noon at the magnificent St. Patrick's Cathedral. We went to Rockefeller's Center, a US National Historic Landmark which is a complex of 19 commercial buildings. I saw the Prometheus statue at the center. There was a skating rink at its plaza. This is also the place where they put the giant Christmas tree during its season. We passed by the Radio Center and NBC studio. Later we dropped by at the Philippine Embassy where we talked to some of the Pinoys there. We also visited the busiest rail station in the US, the Grand Central Terminal. We visited the Empire State where New York was named for as the Empire State. We ate burger at McDonalds then proceeded to the New York Public Library which is a huge one. We walked towards the street of the United Nations Headquarters. I saw the big globe and the replica of a distorted gun. From the UN, we took a taxi to the Madison Square and got off to the Penn Station to take our ride to Bernard's place in Aberdeen, New Jersey. Romeo sent me off to Winnipeg airport and bade each other goodbye. I checked in at Air Canada for my flight to Montreal and flew out at 5:05pm. We touched down at Trudeau International Airport at 8:45pm after 2 hours flight. There is one hour time difference of Winnipeg to Montreal. I waited for my host Maria Delia Dizon, a former high school classmate, since she informed me that she'll be late as she is coming from work. She even asked me what do I wear for her to immediately recognize me since we have not seen each other for so long but when she came in she blurted out with joy when she saw me. We warmly greeted and hugged each other. She introduced me to her hubby Melvin. When we went out to get into the car there was flurries or snow showers. It was another wonderful experience of snow. When we reached their home I was welcomed by her parents Tita Linda and Tito Eddie. They prepared dinner for me and while eating we had a chat. They asked me of the happenings in thePhilippines. They related to me their life in Canada, the good and not so good points in living in Montreal. Madel also introduced her children Mavin, Mariella and Matthew. Montreal is the cultural capital of the province of Quebec. It is the second largest city of Canada and the home to second largest population of native French speaking people in the world after Paris. Even Madel's children speak French language. The signages were mostly in French language and the architecture of buildings were European in style. The buildings looked like that of Paris especially in the Old Montreal. The following day we went to attend the competition of Matthew in ice hockey at Dollard Arena. It was fun watching the game as the boy was clever in playing it. They later brought me to downtown to pick up Madel's friend Elsie. I saw the skyscrappers and the shopping malls which were connected to each other underground. Some museums were also located in the area. We proceeded to the Old Town and Old Port where I got close to the fascinating buildings and the cobblestone roads. It felt like I was in Europe being charmed by old world. We went for lunch at the Chinatown for dimsum, chow mein and peking duck. Then we went to see the Montreal Highlights Festival at the park. We saw some magic shows and other stuff. It was so chilly.It was nasty cold so we went home early. We went back to the place in the evening but we were not lucky to get a parking space. There were lots of cars parked and there were lots of people atttending a show so we just went home. On the next day we visited the fascinating Niagara Falls. We stayed overnight at Best Western Hotel. On succedding days we visited the Saint Joseph Oratory which is a popular landmark of the city located on hilltop overlooking Montreal downtown, the Beaver Lake where many people skates around, Julep where vintage cars were exhibited on summer, the Mont Royal Park, to the lookout where we saw Royal Mountain Police (RCMP) and as a finale to the ski hill of Saint Sauveur for the skiing which i fitted the equipment and tried to slide a bit with it. When i watched the skiiers, it seemed to be so easy. Melvin told me that it was really difficult to maneuver without a rigid training based on his experience. This is something interesting to try as a hobby. I had my farewell dinner at Madel's sister Lilia's house.They even cooked pansit for me. The couple sent me off to the Greyhound Bus Terminal for my trip to New York as I bade them goodbye and thanked them for a great winter experience in Canada. From Richmond I flew to Winnipeg on February 25, 2009 at 9:05am. I went to the airport early since there’s no one available to send me off. I had no smaller bills to pay my fare in the bus but I was so lucky that I met a certain Filipina Rosie who paid for my fare to the airport. It was nice that I had a day flight because I saw the aerial view of Vancouver. It was cloudy. Later on the flight, I saw the sky clear and bright with the sun. I started to see some mountains that were covered with ice. On the territories of Manitoba, every area was frozen. As we advance close to Winnipeg it was totally white. Even the bodies of water were obviously frozen. It was so amazing to see this kind of sight. I was a bit apprehensive that many people tell me that it was totally cold that I should bring a lot of sweaters and jackets and friends even gave me some to use. The pilot even announced to the passengers that we will experience -21 degrees centigrade temperature in Winnipeg. Some passengers reacted. Our plane touched down at 1:45pm after 2 and half hours flight. The time of Manitoba is an hour advance compared to Vancouver. I was picked up by Simone, Romeo’s neighbor, at the airport. We never knew each other but we were able to find each other. She even brought me an extra jacket. When we went out I saw that everything was covered with snow and that the coldness really got in to my nerves. It was really so cold. We rushed in to her car. We had a nice conversation about the weather and whatnot. Winnipeg is the capital city of the province of Manitoba. It is a multicultural community of various ethnic origins such as English, French, Scottish, German, Ukrainian and others. And the visible minorities are the Filipinos with 5.9% of the population. She opened the house of Romeo for me. He has still work so he came by after 5pm. He welcomed me warmly to his house and started me with some snow experience. He gifted me with a toque, let me wore long johns, socks and boots as we got out. We did some exciting snow removal and show blowing in his yard and some other neighbors’. Later, we had a dinner of French Canadian beef stew and French bread with his neighbor Simone and hubby Normand and Romeo’s girlfriend Shauna.We had a good talk. We cited on how we got to know each other. Romeo was former Canadian delegate to a leadership program in Japan where I worked with him as one of their facilitators. Then we watched a movie Vicky Cristina Barcelona movie at his mini-theater. The following day, Romeo took me to the Le Croissant bakeshop where we got croissant cheese and chocolate for breakfast. Then we had a walk tour to the Forks the meeting point of Red and Assiniboine Rivers. We passed by the side-spar-cable-stayed brigde Esplanade Riel. It houses the Salisbury House Restaurant. I stepped on to the longest skating rink of the world and the Guiness book of world record holder. My hand was so painful and that it cannot withstand the cold everytime I take off my gloves to manipulate my camera. We visited also the Forks market where it is a place for foods from all over the world. We had a tour of the parliament building, then to Partage place and had jamming with his friends at Norwood Hotel. We capped the day with a dinner at KG Saigon, a Vietnamese Resto with his friend Rommel and Shauna. On my last day with him, he brought me to the Museum of Manitoba and Man and Nature where I learned history and the heritage of Canada. Then he treated me for a luch with his sister Anette at a Ukrainian resto called Alycia’s. As a finale we visited Fort Gibraltar where the ice scuptures were there to see. It was such an experience of joy of life or joie de vivre in white Winnipeg. It is the coldest part of earth that I have been to. Just imagine a temperature of -45 degrees centigrade of wind chill. They even branded it as “Winterpeg.” My homestay with Romeo made me warm in the midst of freezing coldness. It was indeed a joy of life to experience an uncommon season in my own tropical country. After our dinner reunion in Vancouver, Cristy and her family took me to a night out in downtown. We went to Executive Hotel for some wine and to enjoy band performance. On that night Joey Albert, a popular singer in the Philippines was there to sing with her band. Cristy being a regular customer of the lounge introduced me to Joey and had some chat. She looks gorgeous and still sings so well. 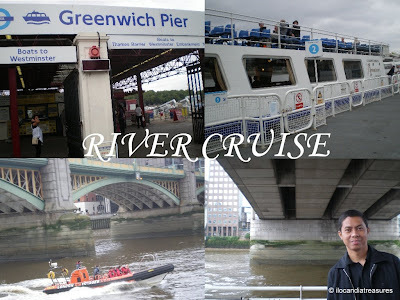 It was a great experience to be cruising on River Thames. On the last leg of my trip to Europe in 2007 I was taken by my friend Rady and sister Esme on a cruise. We went around London. From Greenwich pier to Westminster Abby, a boat charges 7.20 pounds per adult passenger. On our cruise, we passed by several bridges. One of which is the legendary London Bridge. I cannot believe that I finally saw the bridge that we use to sing when we were still kids, singing “London Bridge is falling down.” It was just an ordinary bridge actually. However the elegant bridge we saw was the Tower Bridge. The structure is beautiful. It is one the important and scenic landmarks of London. It is being published on postcards and posters. River Thames is the longest river in England and second in the whole of United Kingdom. It rises from Thames Head in Gloucestershire and flows into the North Sea at the Thames Estuary with a length of 346 km or 215 miles. The word Thames was derived from the Celtic name Tamesas. It probably meant dark or dark grey and that indicates muddiness which is true to its color when I saw. Some of the crossings in the London area with the bridges are Blackfriar’s railway bridge, London Bridge, Tower Bridge, Westminster Bridge, and Millennium Footbridge. Along the river, we have seen the London Eye, the biggest Ferries wheel in Europe operated by British Airways. It is the most popular paid tourist attraction in the UK and the fare is over 15 pounds per adult passenger. We visited Westminster. We took so many photos at the Big Ben and the Houses of Parliament.